A Maine lodge comes alive when filled with family and friends. 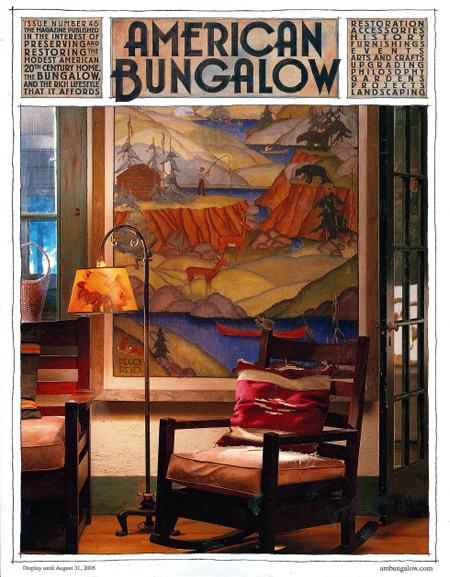 Selling the bungalow lifestyle to the public: charming vintage ephemera. A St. Paul, Minn., home right out of The Craftsman. A fraternity entrusted with a Louis Sullivan home in Madison,Wisc. Filling a Greenwich Village apartment with great Arts and Crafts finds. Canines play a big role in the past and present of a New Jersey home. One woman’s story of saving a vandalized cottage. Rescued from a barn and still in its original frame, this bold, WPA-era painting by Peggy Reid captures the joys of boating, fishing and camping in Maine’s pristine lakes and wooded mountains. The 1901 rocking chair is a hard-to-find Stickley piece originally offered with roan skin upholstery at the hefty price of $22.25, and the settle to the left is of the same vintage but is an even rarer find. A flea-market iron floor lamp lights the scene. Our readers’ send in their photos of bungalows old and new. Straight talk on Life-Time, patination, Heintz and a pre-Arts and Crafts arm chair. Handmade furniture, Wright’s china and kitchen and bath fixtures. A strong work ethic and devotion to hand-crafted furniture resonates with buyers. Plan your summer events and catch up on preservation issues. Finding much to love in both the vintage and modern crafter camps.